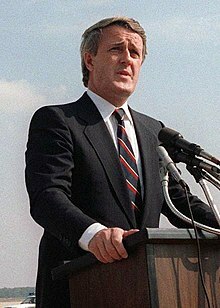 Martin Brian Mulroney (born March 20, 1939), PC, CC, GOQ, was the 18th Prime Minister of Canada from September 17, 1984 to June 25, 1993, and was leader of the Progressive Conservative Party of Canada from 1983 to 1993. His tenure as Prime Minister was marked by the introduction of major economic reforms, such as the Canada-U.S. Free Trade Agreement and the Goods and Services Tax, and the rejection of constitutional reforms such as the Meech Lake Accord and the Charlottetown Accord. Prior to his political career, he was a prominent lawyer and businessman in Montreal. ↑ "School of Canadian Irish Studies - Irene Mulroney Scholarship". Cdnirish.concordia.ca. Retrieved 2010-06-07.